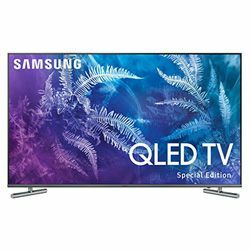 The Samsung QN55Q6F vs Samsung 55NU7100 review is a comparison of 55-inch TVs from new lines. Devices from the line Q6F target the middle price segment and TVs from the NU7100 line are more budget devices. Because of this, TVs with partially similar features are so different in price – 1040 versus 480 dollars. Samsung has excellent image quality thanks to a 10-bit quantum dot matrix, which provides excellent color spectrum and the ability to scale the image to 4K resolution. “Q4KHDR Extreme” technology delivers vivid and colorful images with amazing clarity. Samsung 55NU7100 has a good contrast ratio, but it is not bright enough, for example, for a well-lit room. If you compare it with a TV from the Q6F line, the lack of local dimming is a minus of the 55NU7100 model. Samsung QN55Q6F running Tizen 3.0. The TV has good multimedia capabilities and also allows you to download additional applications. In this Samsung QN55Q6F vs 55NU7100 review, I highlighted the fact that such features as picture-in-picture and voice control, which make it easy to interact with the TV are realized on the basis of Tizen OS. The operating system of the TV 55NU7100 has a simple interface and there is no delay in the work. Samsung 55NU7100 has the function "Smart View". This function allows not only control TV but stream image from your smartphone or PC. The QE55Q6F has a metalized and very thin frame around the screen. Thanks to the silver color of the Samsung QE55Q6F case, it is compatible with any interior color. The stand looks stable, the legs are arranged at a certain angle to the screen in a vertical projection, they are cylindrical. The Samsung 55NU7100 looks very thin. In this Samsung 55NU7100 vs QN55Q6F review, it should be noted the high build quality, there are no gaps in the case. The stand provides stability to the device and is almost entirely made of plastic. The TV Mirroring feature allows you to broadcast the screen of a smartphone to a TV. The model supports two types of HDR - HDR 1000 and HLG. Slowly working with streaming video. The color scheme is not calibrated by the manufacturer; manual calibration is required. 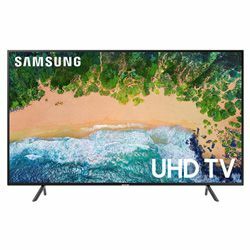 The TV has high dynamic range with the support of technology HDR10 . Thanks to the new scheme of illumination of the matrix, the image has become more detailed and realistic. The matrix has a limited color range. The TV has a low volume.